Yes, this is the real Air Bud from your childhood. You probably remember Air Bud from his days as a sports star in the '90s, where he first dominated a high school basketball court and then went on to play football, soccer, baseball and volleyball. 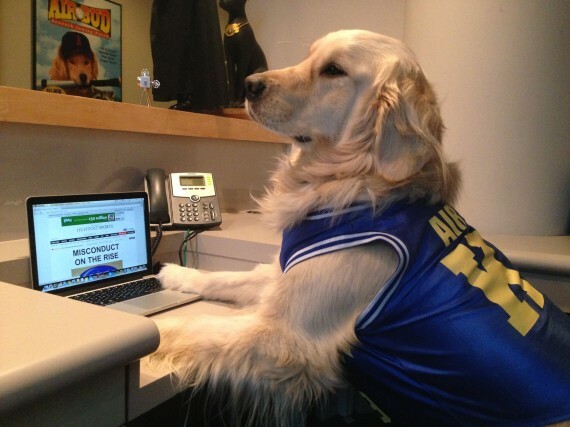 Most recently, Air Bud has joined Twitter (@AirBud) where you can often see him live-tweeting NBA games. 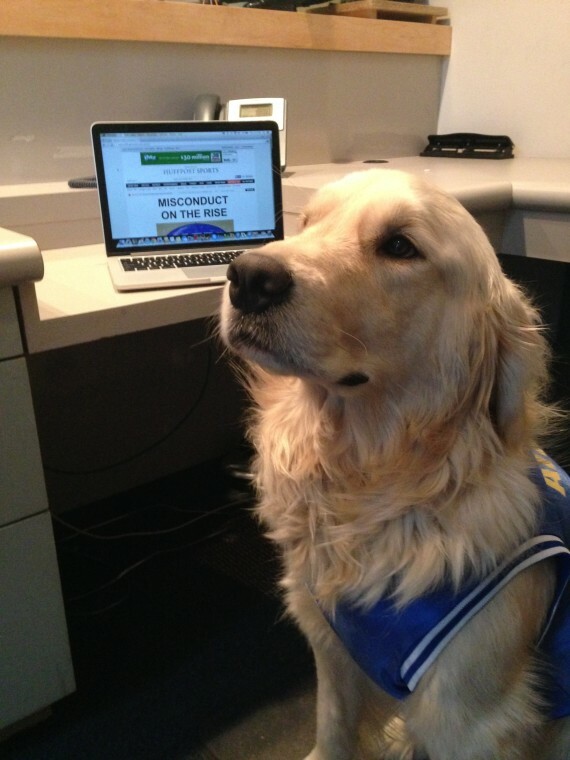 Air Bud has also been promoting another dog's sporting abilities, as his friend Russell is taking on the world of professional wrestling in the upcoming movie "Russell Madness," which will be in theaters Feb. 21. Would this be considered Air Bud’s first interview? Air Bud: Yes, it is! I made some headlines back in my high school basketball days, but I’ve never had the opportunity for an interview. Thanks for reaching out! Who do you think will win Super Bowl XLIX? AB: I’m from Washington, so I have an affinity for the Seahawks, but ultimately the fans will be the true winners because both teams have been working like dogs and it's going to be a great game! HuffPost was also told that Air Bud began a wager with Russell over who will win. Since Air Bud is a Seahawks fan and Russell is for the Patriots, whichever dog's team loses, he'll have to wear the opposing team's jersey. Your mantra as golden receiver was: "It's not whether you win or lose ... it's where you bury the ball." Where would you suggest these two teams bury the ball? AB: In the end zone! Do you think deflating the ball will make it easier to bury? AB: No, but sometimes I use a little slobber! How will you be watching the game? AB: I’ll be watching with all my friends from my YouTube channel, Air Bud TV. There will be lots of treats involved. Everyone will be leaving with doggie bags! Which player do you think will be the MVP or golden receiver? AB: Most Valuable Pooch goes to my pal Russell ... from the all new movie "Russell Madness," of course! Russell Wilson has a pretty awesome Great Dane, though, so he might be fierce competition. When you played, what was it like to be in the middle of a dog pile? AB: I left the dog piles for the humans, and took the ball down the field! Air Bud, do you wish you could have played in the NFL? AB: There is no telling what is in store for me. Everyone has different timing, and you should never quit on your dreams. Do you have any other advice for the two teams? AB: Don’t stop retrievin'; hold on to that feline! ... Oh, and don’t forget your love of the game. Good luck to all! The award-winning star of stage and screen Carol Channing is a genuine American icon, and was at the height of her 'Hello, Dolly!' heyday after starring as a matchmaker in the Broadway-based romcom set in New York. None of which exactly screams "Are you ready for some football?" but making it even worse is that Channing was leading a Mardi Gras tribute despite not having any connection to New Orlean's jazz much less its annual bacchanal.